Miami International Airport (IATA: MIA, ICAO: KMIA) is the primary airport serving the Miami area, United States, eight miles (13 km) northwest of Downtown Miami, in metropolitan Miami.. It is the busiest airport in the state of Florida and is one of the most busiest international air passenger gateway in the world (TOP 25), handling more than 40,000,000 passengers in 2015. Over 70 airlines operate out of the airport. Miami airport features has 3 operating terminals (North Terminal, Central Terminal and South Terminal). 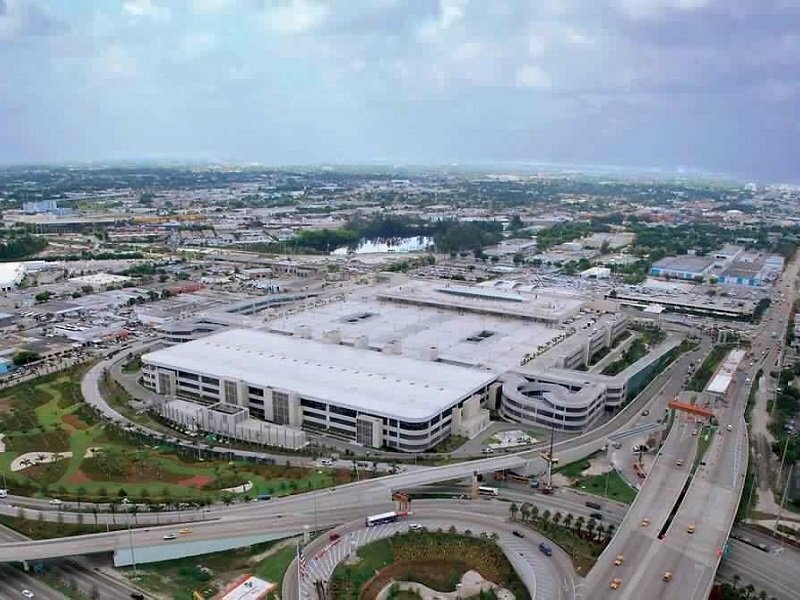 Miami Intl Airport has 3 terminals ; North Terminal, Central Terminal, South Terminal. Concourse E is located within the central Terminal. 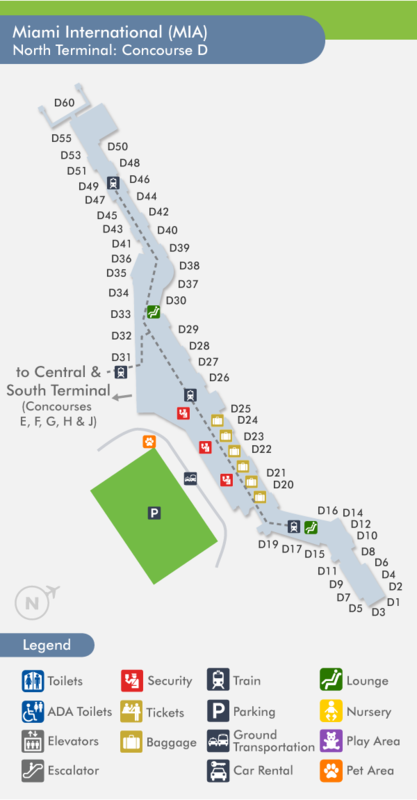 Terminal E has 18 gates: E2, E4-E11, E20-E25, E30, E31, E33. Concourse F is located within the central Terminal. Terminal F has 19 gates: F3-F12, F14-F23. Concourse G is located within the central Terminal. Terminal G has 15 gates: G2-G12, G14-G16, G19. Concourse H is located within the South Terminal. Terminal H has 13 gates: H3-H12, H14, H15, H17. Concourse J is located within the South Terminal. Terminal J has 18 gates: E2, E4-E11, E20-E25, E30, E31, E33. The Miami airport shuttle is a cheap and convenient way to travel to and from Miami International Airport. Miami-Dade County's Metrobus system provides service throughout the Miami metropolitan area. There are more than 90 Metrobus routes and 800 buses. The Miami taxi is a common way to travel to and from Miami International Airport. Miami-Dade County's MetrolRail is an elevated rapid transit system running through the Miami metropolitan area. There are 23 accessible Metrorail stations about one mile apart. Find phone numbers and terminal locations for airlines serving MIA Airpot. Whether dropping someone off or leaving your car a little longer, there are a number of options for Miami Airport parking..
Terminal Tram : The MIA Mover transports passengers between the terminal and the Rental Car Center. ADA Information : The Miami International Airport has designated entryways for picking up and dropping off passengers with special needs. Nurseries : There is no nursery information available for this airport. Kid Play Areas : Miami Airport offers a variety of child friendly restaurants in this airport. Pet Care : There are various open and fenced pet relief areas in MIA Airport. Waste disposal stations are provided at all pet relief areas for cleaning purposes.